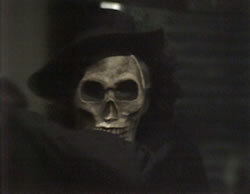 The horror anthology has a long and fascinating history on television in England, with shudder-inducing tales entertaining fans for decades reaching back to the medium's earliest days. 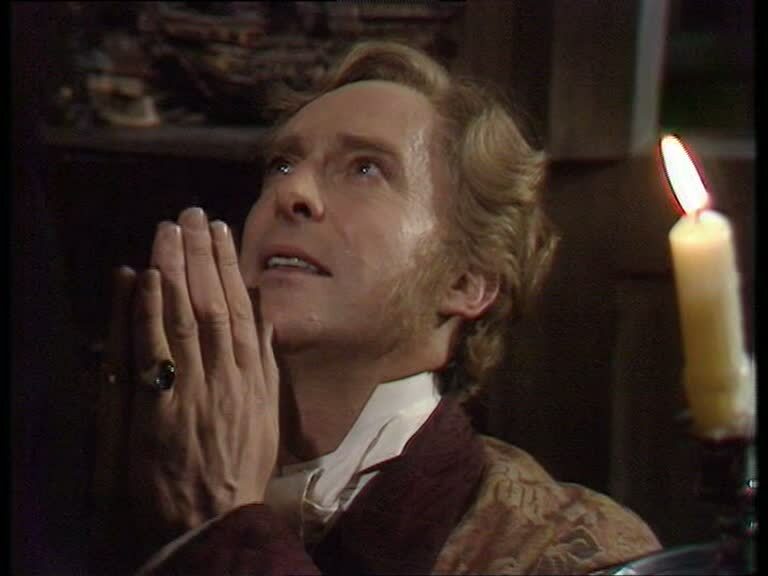 Lost somewhere in the shuffle of '70s programming is the eight-episode series Supernatural (decades before the Winchester brothers' adventures of the same title), a compendium of gothic tales united by a framing device worthy of Amicus. Each story is told by a person seeking admission into the Club of the Damned, who determine whether the tale is chilling enough to pass muster. There's a big downside, however; if the members aren't sufficiently frightened, the storyteller will die. Why anyone would actually want to join a society like this is never really addressed, but it's a catchy hook all the same. 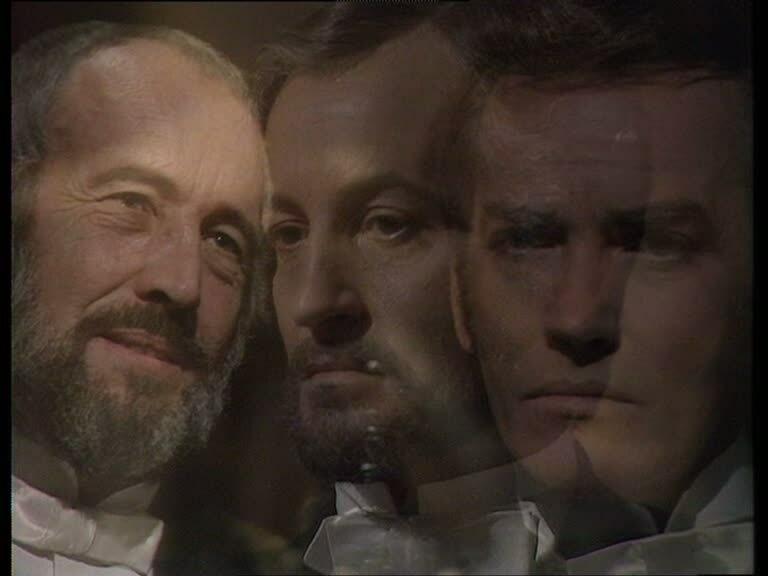 The first and most modest of the stories is "Ghosts of Venice," in which a faded actor named Adrian Gall (Robert Hardy) arrives in the titular Italian city to relive his glory days of acclaimed Shakespearean performances on the stage. He reconnects with an old flame named Leonora (Sinead Cusack) and seems to be traumatized by an incident revolving around his last performance of Macbeth, which resulted in a murder he may have committed. 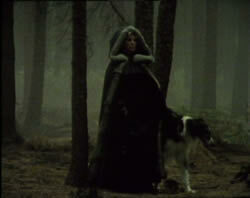 And why is there a skull-faced figure in a black cloak on the loose terrorizing the populace? Though not overtly scary, it's a reasonably enjoyable, literate yarn with a fairly nifty twist ending that gets things started on a promising note. 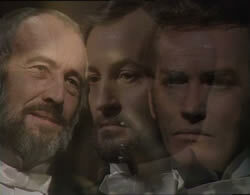 The series really kicks into high gear next with an ambitious two parter, "Countess Ilona" and "The Werewolf Reunion." 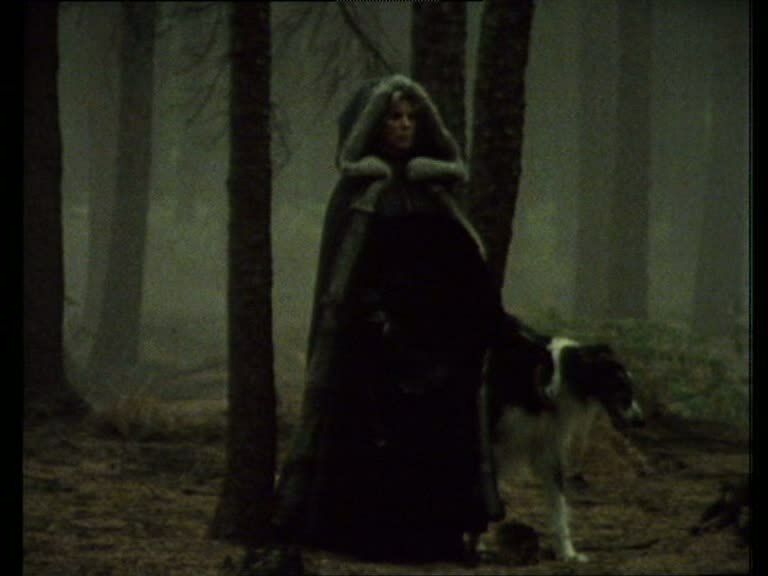 We're introduced to Ilona (Billie Whitelaw, wife of series creator Robert Muller and hot on the heels of her turn in The Omen) as she strolls with her mastiff through a foggy forest in a scene that should delight Jess Franco fans. Living in a secluded house in the German countryside, she's the subject of long-standing rumors involving her depraved, sadistic husband, whom some say she murdered. Now she resides with her introverted son, Bela, who has a mania for candied fruit, and a loyal manservant (Hammer regular Sandor Eles). She invites a trio of male friends for a weekend getaway, all of them sharing a shady past before her marriage (including a nice appearance by Theater of Blood's Ian Hendry). At dinner she dispels the rumors that she killed her husband, instead claiming he died in a hunting accident -- being attacked by wolves. Furthermore, she implies that Bela might actually be the son of one of the weekend guests, thus setting off a chain of murders and revelations. Though the premise sounds a bit like The Beast Must Die, this entry offers a unique spin on werewolf lore with an appropriately decadent atmosphere and a terrific central performance by Whitelaw, whose motivations remain opaque until the closing minutes. Episode four offers a twist on Poe's "William Wilson" in the form of "Mr. Nightingale," a showcase for actor Jeremy Brett before his career-defining role as Sherlock Holmes. Here he's the title character, of course, a bachelor spending some time in the home of a Dutch family, the Steekebecks. He confesses he's afraid of only two things, "dying and loving," and hopes to address them both during his stay. 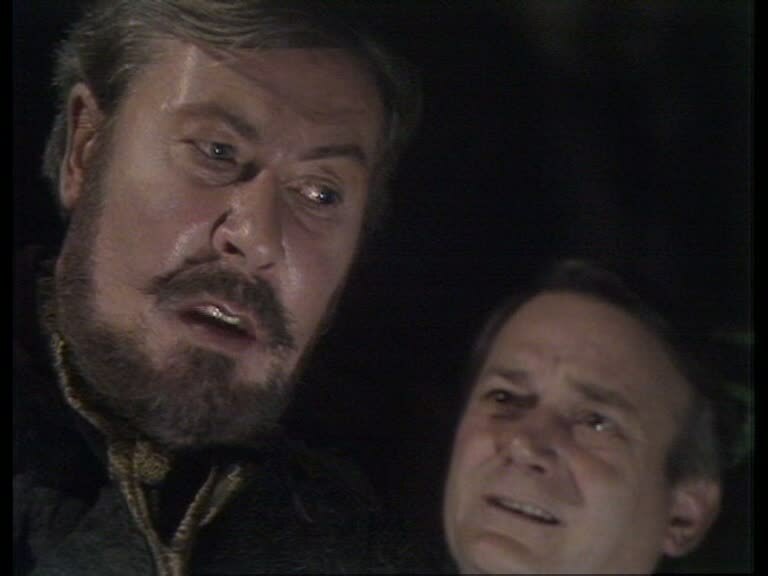 However, he's surprised by the arrival of his identical double, who pops up at inopportune moments and seems to be up to something very nasty. As Nightingale grows friendly with the beautiful Steekebeck daughter, Felizitas (Lesley-Anne Down), his doppelganger appears to be able to supply the exact time and mode of demise for everyone in the house, something that will lead to disaster for all. Though it starts off on a fairly subdued note, this episode really delivers in the second half thanks to Brett's dual performances and supplies perhaps the scariest moment of the entire series, a family dinner interrupted by a shocking intrusion at the window. On we move to disc two, which gets off to an atmospheric start with "Lady Sybil," a tale told by Geoffrey Manners (Denholm Elliott), a layabout, middle-aged aristocratic son whose best friend is his pet chameleon. He lives with his underachieving composer brother, Edward (John Osborne), in a sprawling family estate called Black Gables with their mother, the title character (played by Family Plot's Cathleen Nesbitt, credited as Catherine on the back sleeve for some reason). Lady Sybil is distraught by a prowler she keeps hearing skulking around outside her bedroom door, leaving a trail of "slime" from the garden. Both sons think she's letting her imagination get the better of her, especially since she gets her greatest pleasure from muttering curses at the portrait of their dead father and talking about a drowning death in a shallow pond. Mainly a chatty chamber drama, it's worth seeing for a lively climax in which... well, let's not spoil the fun, but it's an image not soon forgotten and good compensation for a truly odd epilogue. "Viktoria" shakes up the formula a bit by having a prospective member this time wearing a creepy sack over its face and handing off a written story to be read by someone else. Young Viktoria (Genevieve West) enjoys hearing gory bedtime stories from her Slavic grandmother while her wheelchair-bound mother, Elizabeth (Mia Nadasi), sews and chit chats with her snippy, icy father, Paul (Lewis Fiander), who can barely spare a glance for his daughter. One night Elizabeth dies under sinister circumstances, and daddy quickly takes a new wife, Theresa (Catherine Schell). 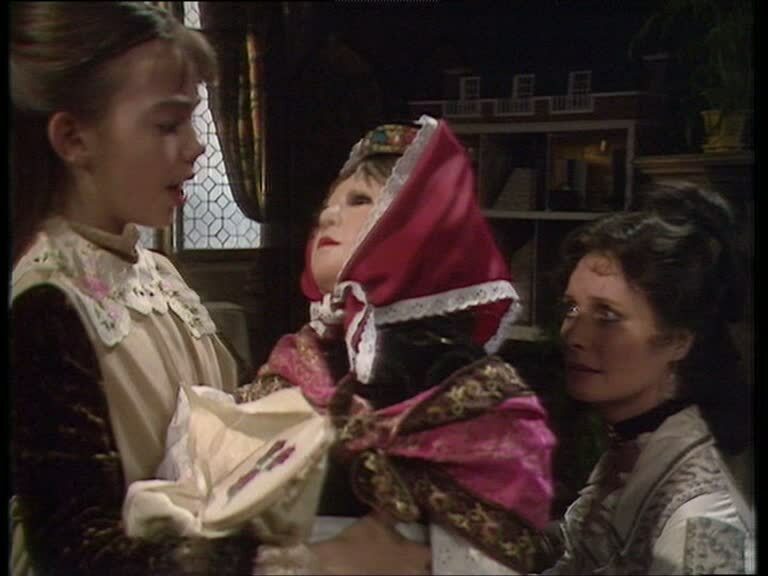 Meanwhile Viktoria becomes unnaturally close to her favorite doll, Rosa, who seems to have a secret of her own... Yes, this is basically a family-themed tweak of the old Talking Tina template from The Twilight Zone, but here the real kicker actually takes place back at the club during the closing seconds; it's a nifty little grace note that sets this one apart from other killer doll stories and feels like something out of an Italian horror film from the same era. The episode most obviously indebted to past horror classics is the inventive "Night of the Marionettes," with an author named Howard Lawrence (The Ipcress File's Gordon Jackson) relating the experiences of writing his "most startling" book, which can never be published. 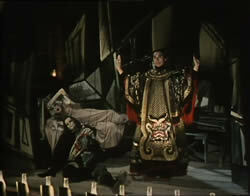 Along with his wife and daughter (Black Narcissus' Kathleen Byron and Poirot's Pauline Moran), he undertook a literary expedition to retrace the steps of Lord Byron and Percy and Mary Shelley to Villa Diodati, where a memorable session of storytelling resulted in the writing of Frankenstein. At a nearby guesthouse (with no crucifixes in sight) they are welcomed by a former circus member, Herr Hubert (the wonderfully hammy Vladek Sheybal from From Russia with Love and The Apple), and unsettled at night by strange rumbling sounds. Howard soon deduces that the Shelleys may have actually stayed at the same spot, and things get even stranger when they attend a popular local puppet show with a particularly expressionist production reminiscent of the Frankenstein story. 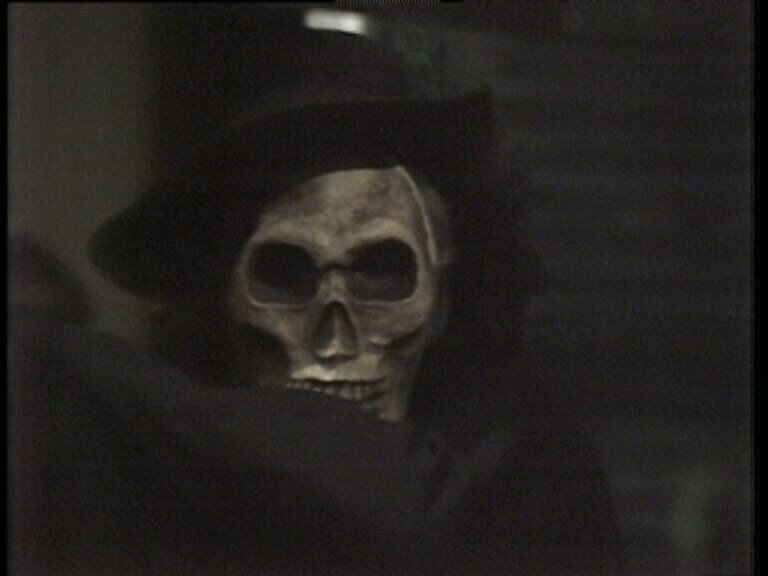 Easily the most flamboyant entry in the series with plenty of wild theatrical flourishes, this is good macabre fun with a vibe similar to classic episodes of Thriller. 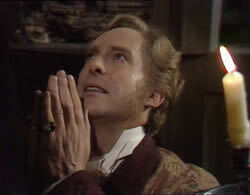 Finally the series closes on a high note with an effective vampire story, "Dorabella," in which the title character (Ania Marson), a singer somehow affiliated with a bizarre performance artist named Amadeus (Jonathan Hyde), bewitches a young man named Walter (Jeremy Clyde) during a visit at a hostel. Walter's traveling companion, Philip (David Robb), is troubled by her growing influence, especially since she never goes out during daylight and can apparently causes birds to magically disappear from their cages. Oh, and people seem to die violently around her. Dorabella urges both men to continue their journey north, but she entrusts Walter with a gold box, instructing him to never open it for fear of losing her forever. A moody and stylish Hammer-style miniature, this fine addition to the bloodsucker canon pays off with a nicely harrowing finale and, of course, the requisite twist ending. All of the episodes clock in around 48 minutes (with a handful running slightly longer), and considering these were all shot on video (a common practice at the time), the transfers here look quite solid (and far better than the dupey collector's copies that managed to turn up here and there). The audio is also much clearer than before, which helps tremendously with some of the more florid dialogue. Very welcome optional English subtitles are included, too. The hefty amount of content doesn't leave much space for extras (though that great Test Card F from the other BBC 2013 gothic releases is presented and accounted for), but the liner notes booklet contains a useful essay by Julian Upton and a Muller bio by Tise Vahimagi. A really fine batch of TV chillers finally rescued from oblivion, and perfect spooky viewing for any time of year. Reviewed on October 28, 2013.